»Wind-drawing«, 1995. The ventilators are started one after the other forming pillars of wind rising up vertically from the floor. 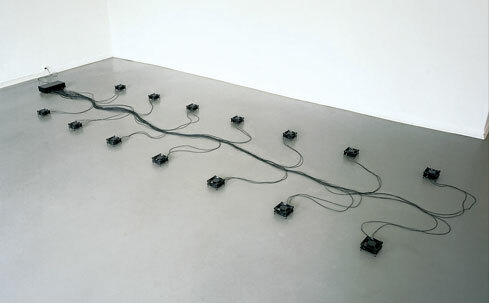 »Conversation«, 2001. An electronic metronome swings with a certain Interval between the radio stations of two countries and alter nately cuts and reinstates electricity. By Finnbogi Petursson.